Rebel Haunt is excited to present a remount of our micro-epic “She Began To Cross The Sky” at Kaleidoscope 2016 in Coquitlam! We will be doing eight performances in total. This version features three live musicians. 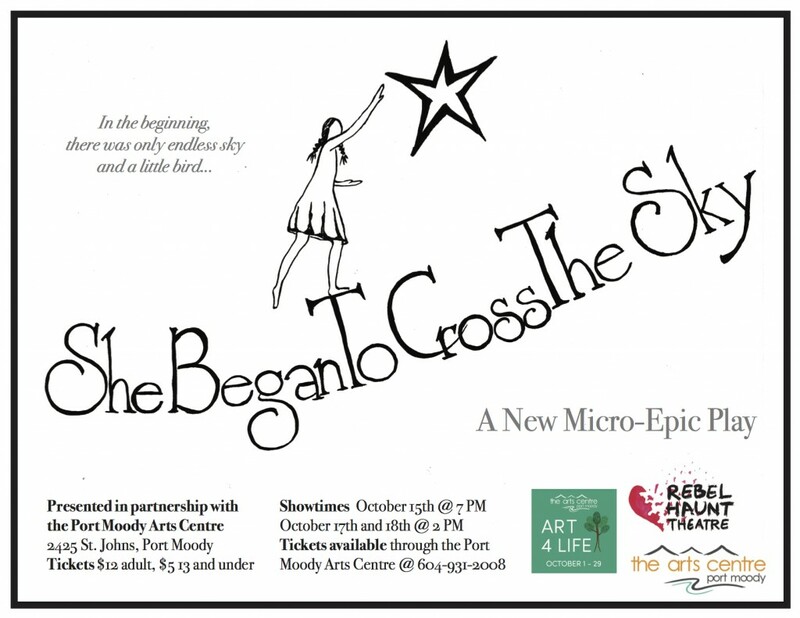 She Began To Cross The Sky is an original Rebel Haunt production created by Sarah Dixon and Julia Siedlanowska. Director Sarah Dixon and performer Julia Siedlanowska present a charming tale about young Josette and her magical journey on a highwire across the heavens. In every moment of of its brief half hour, She Began To Cross The Sky looms large to remind us that even our most naive, childlike creative passions and impulses have within them the same beauty and scope as the universe itself. Presented by Rebel Haunt Theatre in Partnership with the Port Moody Arts Centre as part of their Art 4 Life Exhibition. Tickets $12 adults, $5 13 years and under. Available at the Port Moody Art Centre. She BeganTo Cross The Sky is a brand new original Rebel Haunt production created by Sarah Dixon and Julia Siedlanowska. 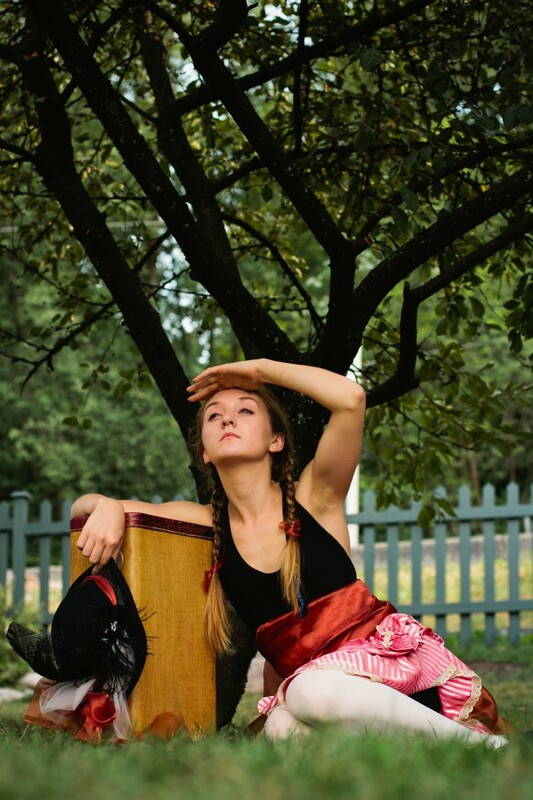 Director Sarah Dixon and performer Julia Siedlanowska present a charming tale about young Josette and her magical journey on a highwire across the heavens. In every moment of of it’s brief half hour, She Began To Cross The Sky looms large to remind us that even our most naive, childlike creative passions and impulses have within them the same beauty and scope as the universe itself! In Dixon and Siedlanowska’s magical tale, brave little Josette refuses to submit to the banal demands of her mother and teacher, and seeks adventure on her highwire. Setting fourth to explore the heavens, she finds herself transformed into a little bird who must use her wits and courage to change the cosmos. In Rebel Haunts Theatres Micro-Epic tradition She Began To Cross The Sky links the immediate with the eternal, and creates a vast universe with very little. Dixon and Siedlanowska have worked together in a variety of productions over the years, and they share the bond of artists who have repeatedly braved the stage in all its fearsome wonder! Come visit Home Town! This time of year you’ll be just in time for the Fall Fair. Visit Abby’s punch canteen and try some caramel corn. After the sack races, check out the crowning of the Fall Fair’s Pumpkin Princess. Head up to the haunted house and meet the ghost. Follow Dog around as he searches for his lost bone. Go to the Fairy Tree to ask them for a favor. Watch the young folk play scrub baseball. Skip a rock in the inlet and make a wish. And say goodbye to Louise as she leaves it all for the first time. Home Town is a site-specific, follow-the-actors show set in the 1930s in a town much like Ioco. The audience follows the actors around the actual Ioco townsite to experience a day in Home Town. Performances will take place on October 6th and October 13th, at 1 PM and again at 3 PM. Admission is by donation. This is a family-friendly show. Everyone is welcome—babies in strollers, leashed dogs, you name it—but please be prepared to walk a few blocks as you follow the actors around the townsite. 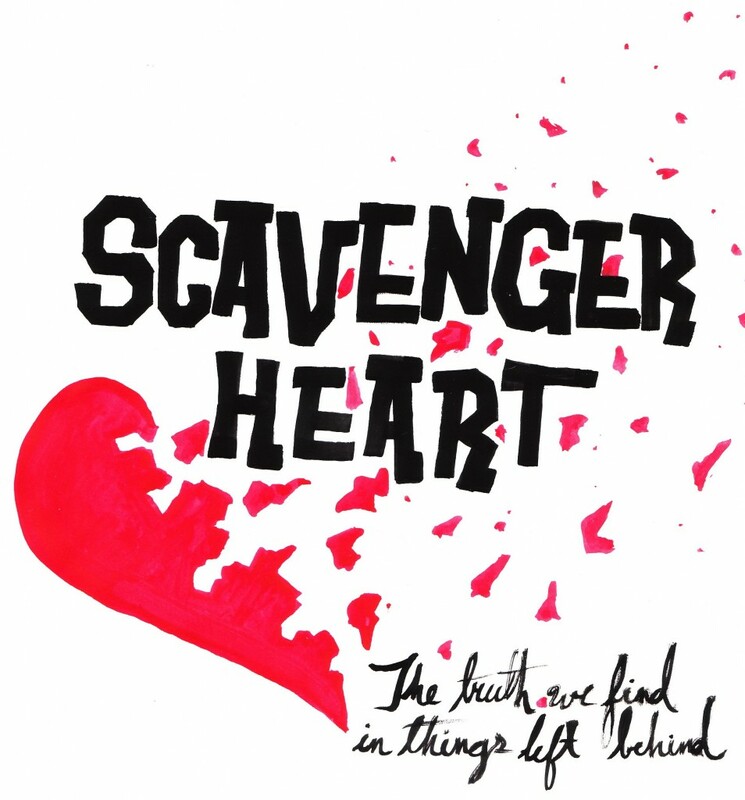 “Scavenger Heart” will be performed on Wed., Thurs., Fri., and Sat., June 13, 14, 15, & 16, at 7:30 PM at the Port Moody Arts Centre. Admission is by donation, with a recommended minimum of $10. The performance is a fundraiser for the Arts Centre, which will receive 50% of the proceeds.